Not only has the next Ultimate Marvel Vs Capcom 3 downloadable costume pack been delayed, it seems to have lost a character. Originally scheduled for release on December 20, the "Ancient Warrior" DLC pack for Capcom's Ultimate Marvel Vs Capcom 3 was to include new costumes for Arthur, Firebrand, Hulk and Magneto. As of this morning however, that is no longer the case. The next scheduled release, "Ancient Warrior Pack," will actually arrive later than expected, moving from December 20 to March 6 in the US and March 7 in Europe. When it arrives early next year, the pack will not contain Magneto as previously stated. This will bring the costume count for the Ancient Warrior pack down to three, retaining Firebrand, Arthur and Hulk. We'll announce pricing details closer to launch. Delays are to be expected from time to time, but dropping a character entirely? That's weird. 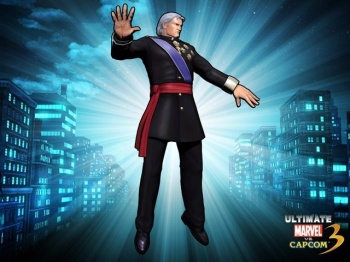 Looking into the matter, we discovered that the costume in question (which is based on Magneto's appearance in Marvel Comics' "House Of M" series) bears a striking resemblance to the official royal uniform of Spanish king Juan Carlos and that since the costume was revealed it has caused a stir in the European nation. Though Capcom's original message mentions no specific reason for dropping Magneto from the DLC line-up, I sent an email to Capcom asking if the Spanish controversy was the impetus behind this decision. The Ancient Warrior Pack originally set to release on December 20th is delayed and will now be released on March 6th in the US and Japan (March 7th for EU and Asia). This pack features new costumes for Arthur, Firebrand and Hulk and will release in March without Magneto's alternate costume due to various factors. For your question regarding the King of Spain's costume and if it was one of the reasons why Magneto was pulled, the official answer we have for you is, yes that was one of the factors. So there you go. Capcom would rather avoid an international incident. That makes sense both financially and diplomatically. Now if we can only convince the company that Pippa Middleton is a huge fan of Mega Man, maybe we'll finally see the Blue Bomber in Ultimate Marvel Vs Capcom 3.